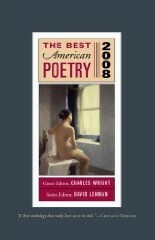 The Best American Poetry 2010, Guest Editor Amy Gerstler, Series Editor David Lehman. 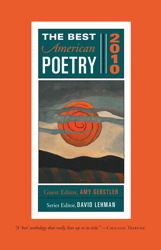 Selected Amy Gerstler as the 2010 guest editor. Sandra Bearsley's "Unit of Measure" — I will always have more interest in the capybara after reading this! Amy Glynn Greacen's "Namaskar" — its ABAAB cinquains are a delightful form, particularly because of her variation of line length (between tetrameter and pentameter) and her use of rhyme (rarely aslant). Sonia Greenfield's "Passing the Barnyard Graveyard" — lightweight yet appealing. Dolly Lemke's "I never went to that movie at 12:45". Camille Norton's "They Prison Diary of Bartlett Yancey Malone". Sharon Old's "Q" — how pleasant to have a humorous poem from Olds, with a balanced political closing edge. James Richarson's "Vectors 2.3: Fifty Aphorisms and Ten-Second Essays" — one can see how quickly someone's poem could become a text for a new religion! For the 2010 issue (guest editor Amy Gerstler): the mode returns to that of the 2008 issue: the 1950s. of birth. 2010 issue. 2009 issue. 2008 issue. 2007 issue. 2006 issue. 1995 issue.